A chronograph is a specific type of watch that is used as a stopwatch combined with a display watch. A basic chronograph has an independent sweep second hand; it can be started, stopped, and returned to zero by successive pressure on the stem. Less simple chronographs use additional complications and can have multiple independent hands to measure seconds, minutes, hours and even tenths of a second. 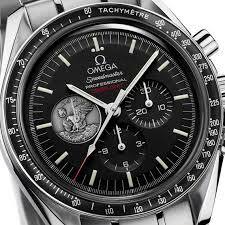 In addition, many modern chronographs use moveable bezels as tachymeters for rapid calculations of speed or distance. Chronographs were also used heavily in artillery fire in the mid to late 1800s. More modern uses of chronographs involve piloting airplanes, car racing, diving and submarine maneuvering. 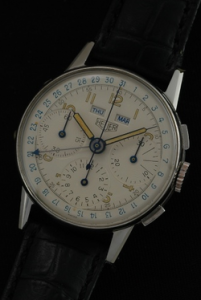 In the early part of the 20th Century many chronographs were sold with fixed bezels marked in order to function as a tachymeter. 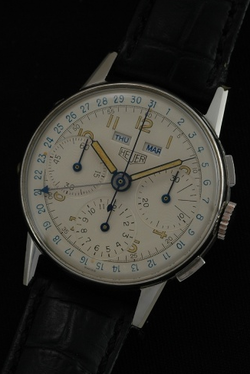 In 1958 the watch company Heuer introduced a model with a rotating bezel tachymeter for more complex calculations. Chronographs were very popular with aviators as they allowed them to make rapid calculations and conduct precise timing. The demand for chronographs grew along with the aviation industry in the early part of the 20th century. As the US exploration of outer space initially involved only test pilots, by order of President Eisenhower,chronographs were on the wrists of many early astronauts. 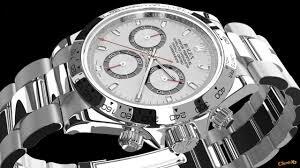 Chronograph usage followed a similar trajectory for many fields that involve very precise and/or repeated timing around increasingly more complicated high performance machinery, automobile racing and naval submarine navigation being two examples. As different uses for the chronograph were discovered, the industry responded with different models introducing such features as the ‘flyback’ (where the second hand could be rapidly reset to zero), minute and hour timers, and waterproof models for divers and swimmers. 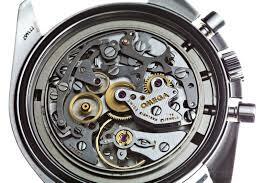 Inside the Complex chronograph Movement. Lots of moving parts!! 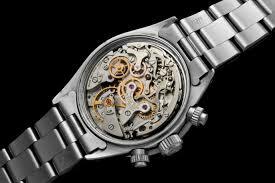 The term chronograph is often confused with the term chronometer. Where “Chronograph” refers to the function of a watch, chronometer is a measure of how well a given timepiece performs: in order to be labeled a chronometer the timepiece must be certified by the COSC, the official Swiss Chronometer testing institute, after undergoing a series of rigorous tests for robustness, accuracy and precision under adverse conditions. A simple watch, without the stopwatch functionality, can be certified a chronometer, as can a clock, for example a ship’s clock used for navigation. Does this mean that you are now servicing chronographs? Thank youu for easily defining the diffferences between two watch types that are frequently mixed up! 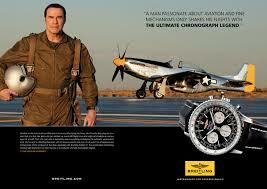 I’ve owned a Breitling Chronograph for many years. It is a beautiful, accurate, and extremely well built watch. It is my favorite.